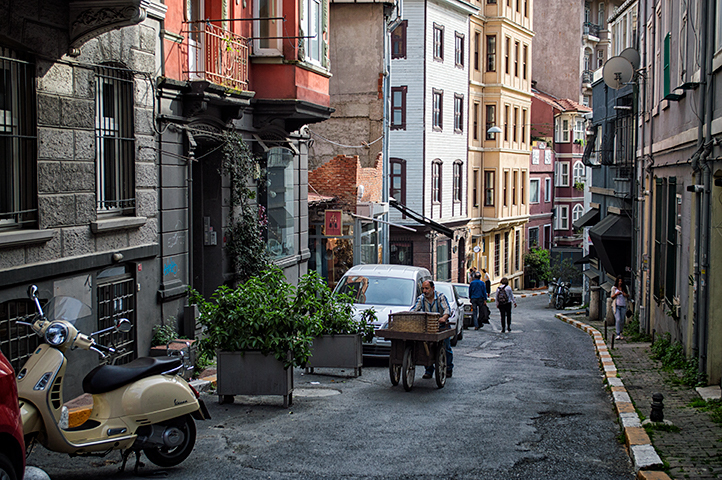 Although still in Europe, when we flew from Rome over to Istanbul, Turkey felt as though we were entering a new world. 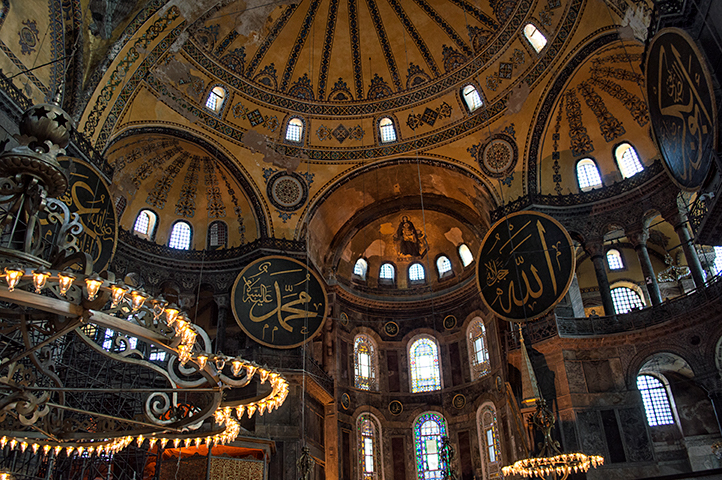 Trading the common Catholic religion for a strong Muslim culture that Pablo was very excited to experience. I’m fascinated with new cultures, but was hesitant on how I as a woman would fit in with this culture and avoid offending any of the customs. I made sure to wear pants that covered my knees, but only had short sleeve shirts and nothing to cover my head due to the hot weather and our limit of clothing space. If anything I planned to buy a hijab (scarf that the Muslim women wear to cover their hair) if needed. 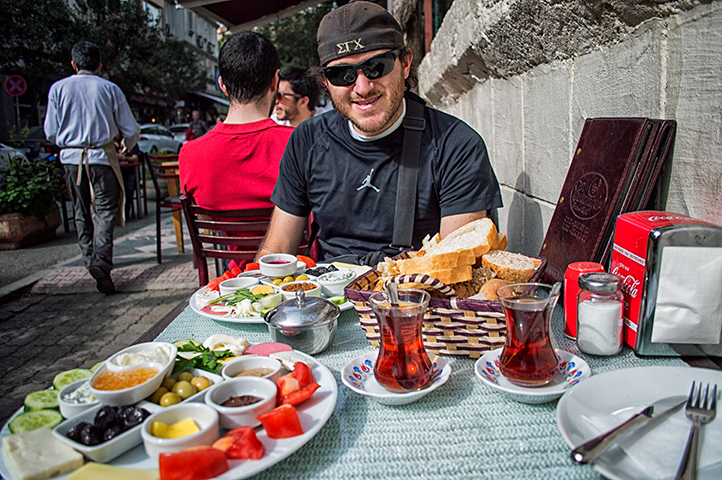 However, we were pleased to discover that it was easy for both of us to feel comfortable the way we were in Istanbul. Our AirBnB/hostel style apartment was walking distance to the inner city and we were surrounded by the culture. We walked up and down steep streets that reminded me of San Francisco, passing stray cats surrounded by feeding bowls put out by locals. Nearby cafes and restaurants were bustling with customers drinking their small teas and sampling cheese and meats from platters. 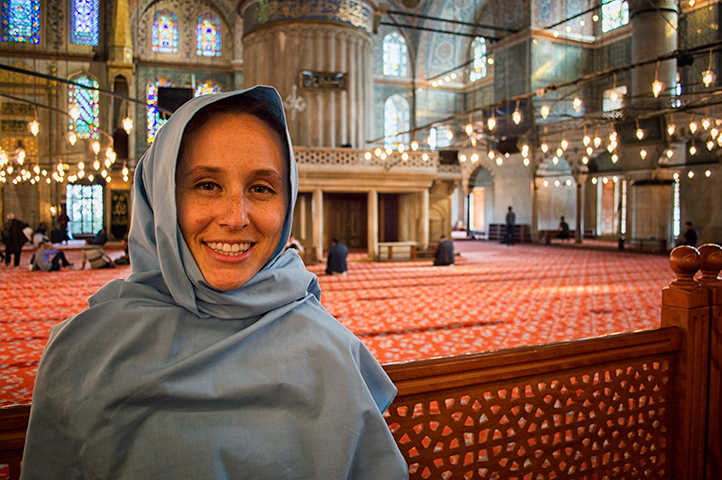 Turkey certainly had the Middle Eastern culture, with several woman wearing the head pieces and the ever present mosques. We had to down appropriate clothing in order to enter the mosque, men needing to wear long trousers but allowed to wear short sleeve shirts. Women needed to cover from their knees and up as well as cover their arms and hair. Clothes were available for rent and all the women were offered the blue hijab. We both had to take off our shoes and carry them in plastic bags. Once we were dressed according to the requirements we entered the beautiful Blue Mosque. In addition to the religious aspects, the food was certainly foreign. We tried the Turkish delights, baklava, Dolma, Pilaf, Borek, Simit and kebabs– all of which were worth swallowing and going for seconds! Ever since trying Borek in Bosnia it’s been a favorite, and we’d been eating kebabs ever since we stepped into Europe (although surprisingly the kebabs from the UK tasted better than kebabs from Turkey even thought they originated from the Middle East). 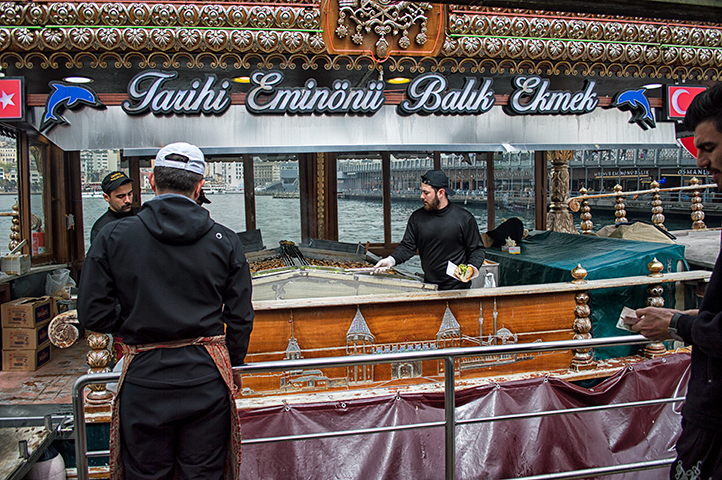 I’ll admit I wouldn’t have several Turkish delights all at once, but one every so often (not a huge fan of gummy food). We were recommended to try the seafood sandwiches that were made right on the boats- almost as if the fisherman were throwing the fish to the fryers and you were eating a fish as fresh as possible. If you like sea food you’d love one of these sandwiches. There was an ice cream vendor who had unforgettable service. He would do something of a show for his customers, teasing them in the process. He handed you the cone of ice cream with a type of long reacher tool. When you’d go to grab it he’d twist it out of your reach meanwhile somehow keeping the ice cream perfectly atop the cone. He brought it close again only to dip the ice cream on my nose. It was a ridiculously talented entertainment that we weren’t expecting and I didn’t know what to make of it. I got tired of the game and grabbed the reacher and he relinquished my ice cream. Funny part is I think he expected a tip at the end. After reading the book Inferno by Dan Brown (highly recommend) I was very intrigued to compare my imagination of the books setting with the real one. 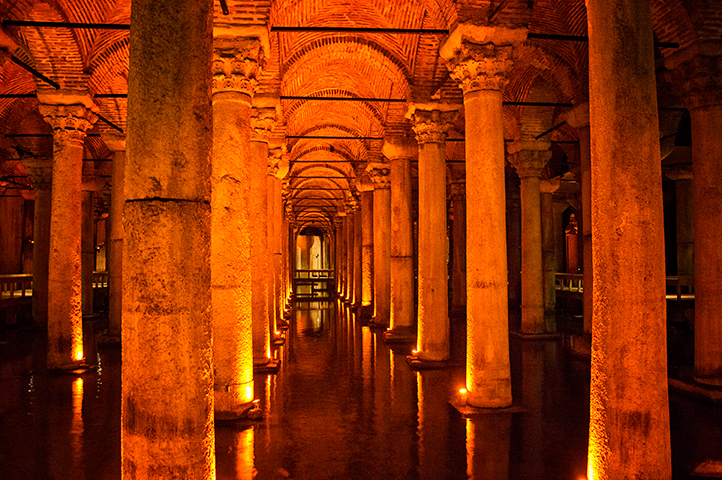 The dark columns cast in yellow glow, dank atmosphere, dark waters and hidden medusa heads were very close to my imagination, but being able to physically experience the place was even eerier. The Grand Bazaar is a huge market in the heart of Istanbul. The market is covered to add to the suffocating feeling that I usually get when shopping with crowds of people. Thanks to our small packs we couldn’t really buy anything larger than a key chain unless we were that dedicated to getting it. We mostly walked around “window shopping” driving the store keepers crazy when we refused to walk into their store, but merely stood a good distance away. Close enough to see what was being sold but not too close to seem that interested and worth bargaining with. The Grand Bazaar would be a tourist’s souvenir collection dream. 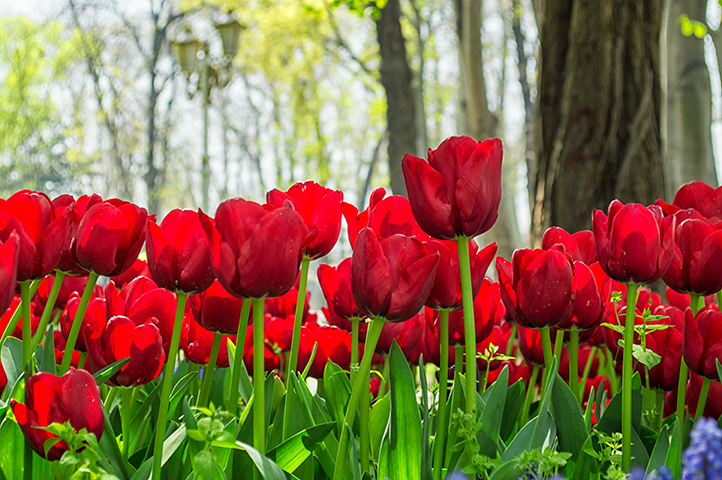 Did you know that although Holland is commonly known for it’s famous tulip fields the tulips were actually shipped there from Turkey? We were visiting Turkey in the Spring and the tulips were sprouting all over the city. They even made a magic carpet design out of tulips in front of the Hagia Sophia. 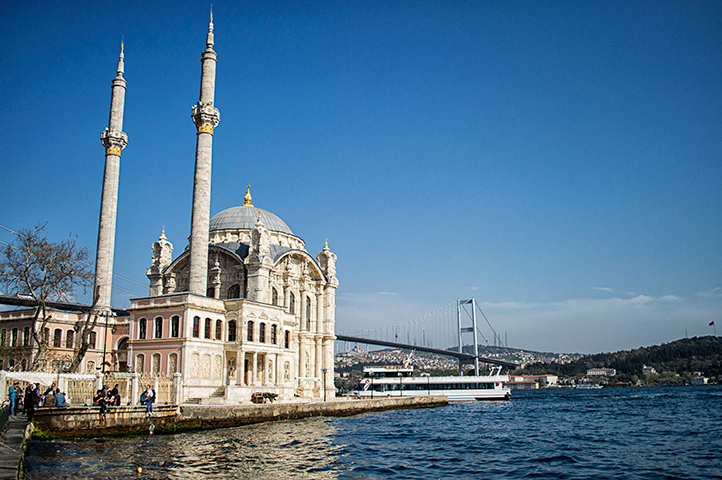 Istanbul is the only city in the world that lies on two continents- Europe and Asia. Our earlier plans were to visit deeper into Turkey making our way to Cappadocia and Mount Nemrut. We also liked that we would be making it to Asia on this trip, but that was before we bounced to several countries further East. Our plans to visit Cappadocia were canceled when several warnings were sent out to travelers to steer clear of Syria’s border. 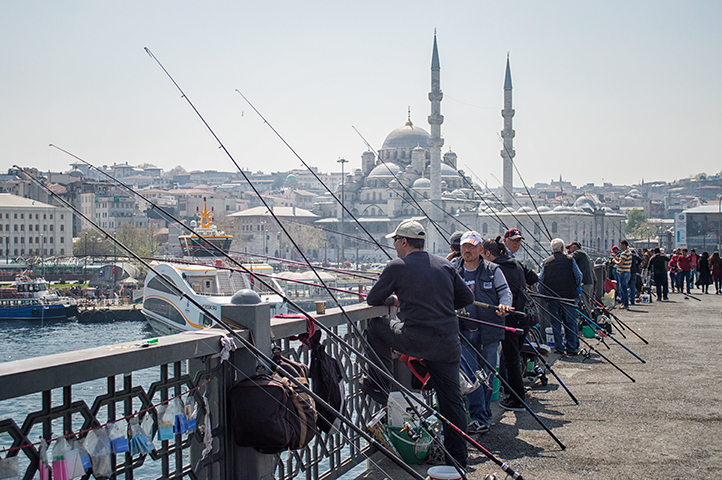 We heeded the warning and only traveled across the Bosporus to the Asia side of Istanbul. There wasn’t a difference between the sides and several locals seem to make the crossing over the water on a daily basis like someone in New York crossing the Hudson to get to work. While there we mostly copied what the locals did- which was sit on pads snacking and socializing. For those of you that don’t remember or maybe didn’t even know, but we were in Europe during some crazy times. We were there a few months before the coo happened where everything was in lock down. It started with the bombings in France after we were there just a couple months prior, followed by several threats, attacks and bombings in Europe and Asia. I don’t usually stress over the dangers while traveling, but it was in the back of my mind at the time, specifically while we were in Turkey. While we were walking in the city of Istanbul enjoying the sites we came up to a busy sports arena. There were thick crowds everywhere and streams of people when I got a sudden sense of panic. Standing out among the fans were fully decked police officials with body length bullet proof shields, and covered head to toe in protective gear. They were quickly lining up along the streets. There were large army vehicles thronging the streets and people stopping to see what was going on. I tried not to let the change in atmosphere cloud my thoughts and I could tell Pablo sensed as well that we needed to hurry out of there. We were herded like cattle with the locals away from the stadium, some stupidly stopping to take pictures of the scene. We never found out exactly what was happening or if something was prevented from happening. I’m just grateful nothing had. Let’s not end on a bad note! In the end I didn’t know what to make of Turkey, but I know I was grateful for the experience to be there. I tend to try and compare places that I’ve been to each other, and although they have the similarities in the end they’re all distinctive. Istanbul was certainly unique and such an amazing city to experience. What’s a really unique place you’ve experienced?